As soon as he opens his mouth to defend himself, Chant makes things worse, and he’s imprisoned and facing a death sentence. His publicly appointed advocate, Consanza, is a reluctant helper at best, and certainly not an ally. Worse, Chant has come to the attention of several of the Primes, the elected rules of Nuryevet — in particular, the Queen of Pattern (think CIA). He uses the only tool available to him, his skill in telling stories, in increasingly desperate attempts to regain his freedom. Chant’s vocation stems from an ancient group who functioned as priests for a trickster god named Shuggwa, and Chant functions in this story as a trickster. He uses stories to manipulate people, often with (at least seemingly) unintended consequences, but at the same time he reveres stories and sees story collecting and storytelling as a solemn, sacred duty. In contrast, there is little sacred about the stagnant, bureaucratic government of Nuryevet, with its five Primes: Order, Justice, Law, Commerce and Pattern. Although each “Prime” goes by the title of King or Queen, the positions are elected, for various durations. Consanza, a cynical and jaded member of this society, points out that the people of Nuryevet are luckier than other countries, even if their rulers are terrible, because the people get to choose them. It is clear the government is imploding, ruling the country in a way that is inequitable and toxic, but Chant insists that’s not his concern. He yearns to find his apprentice, Ylfing, and escape, but what he sets in motion is much bigger than that. From the opening lines, it’s clear Chant is telling a story. At first it seems that the “you” to whom he is telling the story is a general listener (reader) audience, but as the story goes on, we learn he is talking to a particular person with a vested interest in the outcome. Chant is a classic unreliable narrator (even to himself at times) and a classic trickster. Chant, an old man, insists that his eyesight is “as good now as it ever was,” and that the pangs in his chest and moisture in his eyes after certain interactions with Ylfing are not from deep emotion, but probably just mild heart attacks. Chant is even less reliable, however, when he interacts with the Queen of Pattern, the Queen of Coin (Commerce) and the Queen of Order. He soon gets the measure of each of them and begins influencing them with his stories. 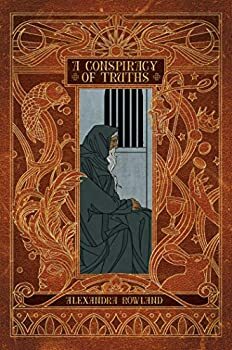 For a story that takes place mostly within prison cells, where it seems pretty likely the first person narrator has not been executed, A Conspiracy of Truths becomes surprisingly suspenseful. Partly this is because there are characters at risk, particularly Ylfing and Consanza, but the suspense comes also not from “what will happen,” but “how will it happen?” And the book allows time for thoughtful moments when Ylfing and Chant talk about the nature of stories, human nature, and “shared hallucinations,” like money. This is not a perfect book for me, because I did notice that I was not easily engaged, no matter how grimly funny the first few pages were. I was amused when Chant’s fulsome apology to the court, evoking a fabled mariner as a metaphor, blew up in his face, but I still could have put down the book at that point. I wasn’t truly hooked until Chant confronted the Queen of Pattern. Terry, what is your impression of the book? You also mentioned that it started slowly for you. Terry: I almost gave up on this book entirely after about the first 50 pages, because it seemed like a jokey book to me with nothing to hold my interest. (Note that I dislike “funny” science fiction and fantasy, having been spoiled on the notion by reading too much Piers Anthony in my youth.) Once the Primes started visiting Chant, though, A Conspiracy of Truths became considerably more interesting to me, and as the political aspects of the book ramped up, it became fascinating. The more Chant became revealed as something more than a foolish old man who had lost his internal censor and therefore gotten himself in trouble, the more I enjoyed it. What did you think of the stories Chant told? I generally liked them, though I was disappointed that they didn’t play more of a role in the development of Chant’s own story. They served about the same function as a palate cleanser does in a multi-course meal — pleasant but not, ultimately, what I was there for. Marion: I thought the discussions about the stories were more important than the stories themselves. One of my favorite moments is the debate Chant and Ylfing have over whether people are all the same, or all different, when Ylfing states that anyone recognizes a love story, and Chant agrees, but then says that depending on your culture, you will take a different lesson from the love story. What did you think of the blackwitches? I enjoyed the fact that Rowland never entirely commits to whether blackwitches actually have magical powers. Sometimes it seems that they absolutely must, but I was put in mind of Arthur C. Clarke’s famous Third Law, “Any sufficiently advanced technology is indistinguishable from magic.” It doesn’t seem to me that anything that the blackwitches do is impossible to explain as either a bit of technology that Chant doesn’t know about or a figment of his imagination (especially in light of his harsh imprisonment). Really? I had a different take. I thought they were quite real because of Chant’s physical reaction to them (even before he knew what they were) and the smell. Which still doesn’t preclude technology. It allowed Rowland to create a nice ironic twist with something Chant makes up about one of the Primes — or thinks he’s making up at the time. Is this really a story about storytelling? Certainly Chant gets himself both into and out of trouble with his tales, and his whole approach to the Primes seems to be to invent a story in which he is a prisoner trying to get out of trouble — he’s making his life into a story, so to speak. He uses his storytelling not just to make people feel better (though there’s plenty of that), but also to manipulate others, and sometimes it seems as if he is even manipulating himself. But ultimately I did not see this as a recursive novel. The tales don’t nest in any way, and mostly have little effect of the primary story, and there is little discussion of the importance of storytelling in any culture, including the one Chant finds himself in. Instead, I see this as primarily a political novel. Of course, politics has a lot to do with story; think of the stories we’ve built up around JFK, Obama and Trump, from both ends of the political spectrum. But that’s not the goal of politics; the story serves the purpose, rather than being the point. I think at this point you don’t have politics without story — even though the buzzword is “narrative.” And the stories that drive this book aren’t the “classics” that are broken out; they are the stories Chant creates, starting with that apology — the stories that blow up in his face, or work far better than expected. It was an interesting note to me that none of the propaganda Chant writes for the Queen of Coin ever appears in the book. I don’t think stories have to follow a specific formula for a work to be “about” story. Notice how many of the “classic” tales are unfinished. To me A Conspiracy of Truths is clearly a book about story, wrapped in a story. I also have no trouble seeing it as a political novel, or even a jailbreak story in the tradition of The Shawshank Redemption if it comes that. My bottom line is that A Conspiracy of Truths is a good read, especially for a debut novel. I’m glad I didn’t quit early on, and I encourage readers to keep going through the sluggish opening section. I don’t think it’s one of the best novels of 2018, but it’s definitely promising; I’m looking forward to what Rowland comes up with next. I think we’re agreed that Rowland is one to watch! Published in October 2018. A wrongfully imprisoned storyteller spins stories from his jail cell that just might have the power to save him—and take down his jailers too. Arrested on accusations of witchcraft and treason, Chant finds himself trapped in a cold, filthy jail cell in a foreign land. With only his advocate, the unhelpful and uninterested Consanza, he quickly finds himself cast as a bargaining chip in a brewing battle between the five rulers of this small, backwards, and petty nation. Or, at least, that’s how he would tell the story. In truth, Chant has little idea of what is happening outside the walls of his cell, but he must quickly start to unravel the puzzle of his imprisonment before they execute him for his alleged crimes. But Chant is no witch—he is a member of a rare and obscure order of wandering storytellers. With no country to call his home, and no people to claim as his own, all Chant has is his wits and his apprentice, a lad more interested in wooing handsome shepherds than learning the ways of the world. And yet, he has one great power: his stories in the ears of the rulers determined to prosecute him for betraying a nation he knows next to nothing about. The tales he tells will topple the Queens of Nuryevet and just maybe, save his life.